Post and Go machine A010 at STEAM GWR will carry the locomotive design from the RM Heritage set from 25 February 2016 to celebrate the 175th Anniversary of Swindon Works. 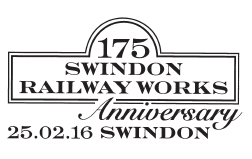 The stamp will carry the underprint ‘Swindon 175’ together with the standard ‘STEAM GWR’ identifier. The underprint will run until the end of the year.